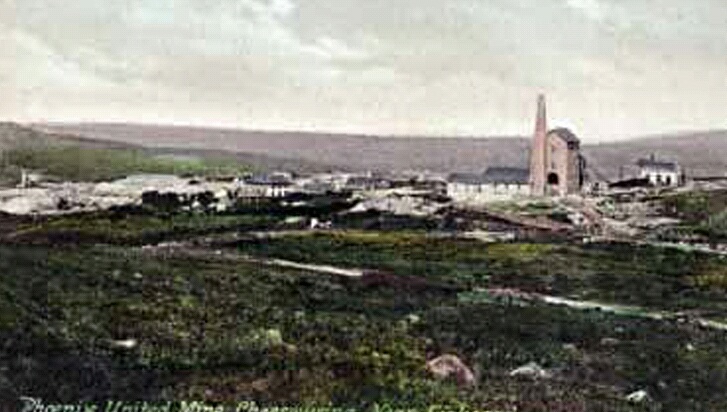 Phoenix United was one of the great success stories of mining in the Liskeard area of Southeast Cornwall, with a history worthy of its name. Its rich single lode has been worked from pre-history to the 20th Century. In the 1830’s Phoenix commenced working as a copper mine, but then in the 1860’s underwent a major transformation into a tin producer, a transition instigated by the famous Cornish Engineer, William West. When Phoenix United closed in 1898, it was the longest operating mine in the Liskeard District. This long history would have been extend deep into the 20th Century if an attempt at re-opening in 1907 had been successful. Much of the mine is on open access ground, where it can be explored from the car parks at Minions Village. The majority of the structures built as part of William West’s redevelopment of the site were unfortunately demolished, shortly after the mine’s closure. However, there is still much to be discovered beneath the vegetation that grows on the expansive waste tips, including the spectacular masonry of the water wheel casing in the valley bottom. The modern attempt at working the sett between 1907 and 1914 has left the site with an impressive legacy of buildings, including the much painted Prince of Wales Shaft engine house. Where is Phoenix United Mine? When did Phoenix United mine work? Phoenix United Mine in 2015- according to the Ordnance Survey. What steam engines were at Phoenix United? Where are the remains at Phoenix United? William West’s speech to the miners at Phoenix United. If you are in the Liskeard area then pop along to the Bookshop on the parade to browse their local history shelves.